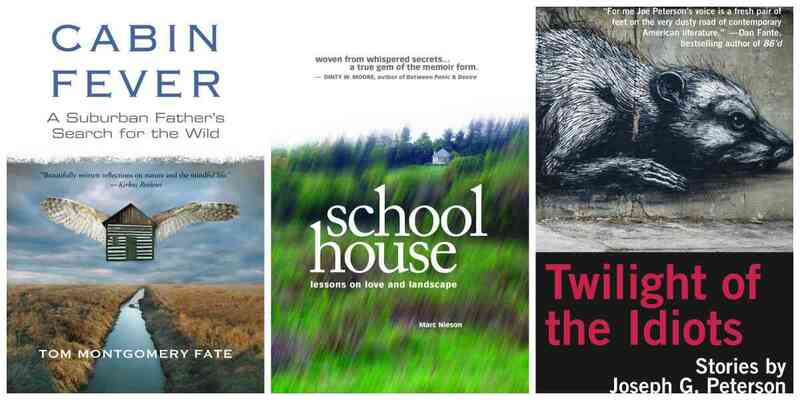 Tom Fate, Marc Nieson and Joe Peterson will each read from and discuss their newest books. About Cabin Fever - Try to imagine Thoreau married, with a job, three kids, and a minivan. This is the sensibility—serious yet irreverent—that suffuses Cabin Fever: A Suburban Father's Search for the Wild, as the author seeks to apply the hermit-philosopher’s insights to a busy modern life. Tom Montgomery Fate lives in a Chicago suburb, where he is a husband, father, professor, and active member of his community. He also lives in a cabin built with the help of friends in the Michigan woods, where he walks by the river, chops wood, and reads Thoreau by candlelight. Fate seeks a more attentive, deliberate way of seeing the world and our place in it, not only in the woods but also in the context of our relationships and society. In his search for “a more deliberate life” amid a high-tech, material world, Fate invites readers into an interrogation of their own lives, and into a new kind of vision: the possibility of enough in a culture of more. About Tom Montgomery Fate - Tom Montgomery Fate is the author of five books of nonfiction, including Beyond the White Noise, a collection of essays, Steady and Trembling, a spiritual memoir, and Cabin Fever, a nature memoir. His essays appear in The Chicago Tribune, The Boston Globe, Orion, and The Iowa Review, among others; and they have often aired on NPR, PRI and Chicago Public Radio. He teaches creative writing at College of DuPage in suburban Chicago. About Schoolhouse - Imagine Walden recast as a love story. This intimate memoir opens with its Brooklyn-born narrator standing on his head outside an old one-room schoolhouse amid 500 acres of remote woodlands in Iowa - on the lam from a love affair gone sour and a myopic past. Structured like a schoolbook, each chapter is named after a school subject (i.e. Geography, Civics, Anatomy, What I Did On My Summer Vacation ...), which collectively forms an overall lesson plan for the author's personal reeducation. Turns out the Midwestern Heartland won't allow him to hide out forever. Schoolhouse: Lessons on Love & Landscape is a modern day search for where identity, place, and heart all intersect. A Waldenesque study in both nature and human nature. About Twilight of the Idiots - Know thyself and nothing in excess. Just as the doomed sailors of Homer's Odyssey fail to heed one or the other of these maxims, and end up getting turned to swine or lured to their peril by the singing sirens, so too do the doomed characters in Joseph G. Peterson's new collection of stories fail idiotically in one way or another and end up, like those ancient sailors, facing the prospect of their own mortal twilight. Set mostly in Chicago and by turns gruesome, violent, comic, lurid and perverse, these stories are suffused with a metaphorical light that lends beauty and joy to the experience of reading them. About Joseph G. Peterson - Joseph G. Peterson is the author of the novels, Beautiful Piece, Elevator Man, and Gideon's Confession. He has also written a book-length poem, Inside the Whale, and most recently a short-story collection, Twilight of the Idiots. He grew up in Chicago where he works in publishing and lives with his wife and two daughters.